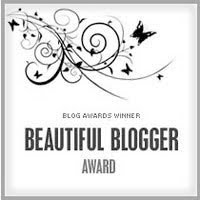 I'm always a little leary of external rewards that try to motivate me into performing (aside from chocolate and an exceptional cup of Jasmine tea, of course), but since it seems the Beautiful Blogger Award is done out of pure kindness, I willingly comply. 1. I'm a recovering Mt. Dew addict. 2. During my seven years in college, to my father's dismay, I declared 4 majors; Accounting, Social work, Speech Therapy, & Finance. I ended up graduating with a BS in Finance, but what I really wanted to be was a marine biologist with an art minor. I'm only 31, so there's LOTS of time! 3. I'm a Scorpio. Nuff said. 4. I'm deaf in my left ear, caused by a high fever I had as a young child. 6. I'm passionate about stopping hunger across the globe, and believe that NO ONE should be denied the right for basic human needs. Did you know that 1 in 6 Americans go hungry every day. Take a good look around your neighborhood, because hunger doesn't only affect people in poverty. Over 50% of the families using local food shelves are full time, working families who have to choose between rent and food. Mothers, you know how hard it is to nurture your family when you don't take care of yourself. Imagine what we could do as a country, if we collectively nurtured one another. A country who respects and takes care of its people first inward, are better able to radiate that love and extend a hand to fight hunger in the rest of the world. Please, next time you're at the market, put something in the food shelf bin. Even if it's just one $.99 can of veggies. If you don't have a bin at your market, ask about setting one up for your local food center. 7. I play the viola, a little piano, and recently took up the harmonica.